The federal government is expanding a program that allows Medicare Advantage insurers to encourage chronically ill seniors to use high-value services by lowering out-of-pocket costs. Insurers in 25 states will be able to apply for the Medicare Advantage Value-Based Insurance Design Model in 2019, the CMS announced Wednesday. The program is available to insurers in 10 states in 2018. Additionally, the federal government is tweaking the model to allow Chronic Conditions Special Needs Plans to participate, and allow participants to propose methods for identifying enrollees with different chronic conditions than those previously allowed by the CMS, such as lower back pain, chronic kidney disease, obesity, asthma or tobacco use. 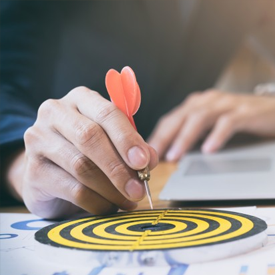 The Center for Medical and Medicaid Innovation unveiled the five-year experiment in value-based insurance design in Medicare Advantage plans in 2015. It started with seven states in January 2017. Efforts to reduce healthcare costs and improve quality has been one of the few bipartisan issues in Congress. "This administration is committed to making sure that our seniors have more choices and lower premiums in their Medicare Advantage plans," CMS Administrator Seema Verma said in a statement. "CMS expects that this demonstration will provide insights into future innovations for the Medicare Advantage program." The point of value-based insurance design is to get rid of the financial barriers, such as high co-payments, that sick patients often face when they are trying to get certain exams, prescription drugs and procedures. Proponents of VBID explain that if patients with chronic conditions are able to obtain high-quality care that is recommended by doctors for free or at a reduced cost, then they are more likely to get that care and avoid potentially more expensive medical services down the road. On the flipside, cost-sharing would increase for services that offer little to no value for patients. 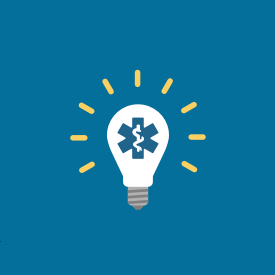 Private insurers and self-insured employers are already implementing VBID programs, and evidence has shown that such programs have led to improved medication adherence and reduced costs for chronically ill patients. President Barack Obama in December 2016 also authorized Tricare, which provides healthcare coverage to 9.4 million people in the armed services, retirees and their families, to pilot VBID in its plans starting in 2018. About a third of Medicare beneficiaries, or 19 million people, are enrolled in a private Medicare Advantage plan. Enrollment continues to grow as baby boomers age into the program at a rapid clip. The U.S. House of Representatives is considering legislation (H.R. 3922) to extend funding for the Children’s Health Insurance Program that includes a provision to increase Medicare premiums for some higher-income beneficiaries to help offset the cost of the legislation. The Congressional Budget Office (CBO) has estimated that this provision would increase Medicare's premium revenues (and thereby reduce program spending) by $5.8 billion between 2018 and 2027. 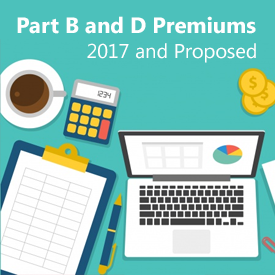 This issue brief describes current requirements with respect to Medicare's Part B and Part D income-related premiums and proposed changes under the House legislation. Today, most Medicare beneficiaries pay the standard monthly premium, which is set to cover 25 percent of Part B and Part D program costs, but a relatively small share of beneficiaries (around 6 percent in 2015) with incomes above $85,000 for single people and $170,000 for married couples are required to pay higher premiums for Medicare Part B and Part D—ranging from 35 percent to 80 percent of program costs, depending on their incomes (Figure 1). Monthly premiums for most people on Medicare equal 25 percent of average per capita Part B expenditures for Part B enrollees and 25.5 percent of average per capita Part D expenditures for drug plan enrollees. In 2017, the Part B standard monthly premium is $134; for Part D, the national average monthly premium, according to CMS, is $35.63. Actual monthly premiums for stand-alone Part D drug plans vary across plans and regions from a low of $14.60 to a high of $179 in 2017. Beneficiaries with incomes above $133,500 and up to $160,000 ($267,000-$320,000 for married couples) will pay 65 percent of Part B and Part D program costs starting in 2018, up from 50 percent prior to 2018. 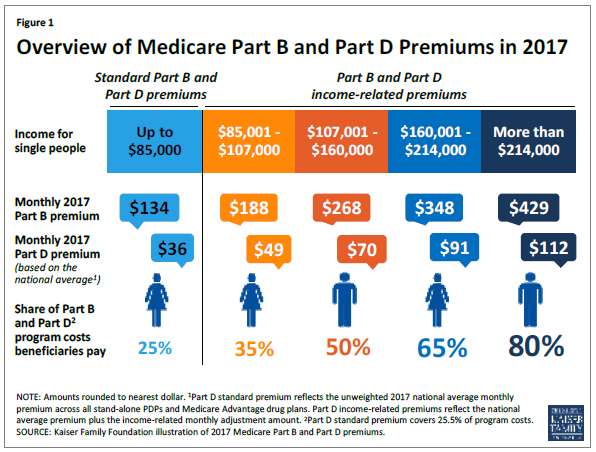 As a result of this change, monthly Part B premiums are expected to be $348 in 2018 for beneficiaries in this income group, rather than $268 that year, based on projections of Part B program costs from the Medicare Trustees. Beneficiaries with incomes above $160,000 and up to $214,000 ($320,000-$428,000 for married couples) will be required to pay 80 percent of Part B and Part D program costs, rather than 65 percent. As a result of this change, Part B premiums in 2018 are expected to be $429 per month for beneficiaries in this income group, rather than $348 per month in that year, based on projections from the Medicare Trustees. The income thresholds that determine the income-related premium payments are frozen through 2019, but will increase by about 2 percent in 2020 and will be indexed after that for general price inflation. In 2017, Part B premiums for higher-income beneficiaries range from $188 per month for individuals with annual incomes above $85,000 up to $107,000, to $429 per month for individuals with incomes above $214,000. For Part D, higher-income beneficiaries pay a monthly premium surcharge in addition to the premium for their specific Part D plan; in 2017, the monthly premium surcharge ranges from around $13 for individuals with annual income above $85,000 up to $107,000, to an additional $76 for individuals with incomes above $214,000. When combined with the national average premium amount, higher-income Part D enrollees pay between $49 and $112 per month in 2017. 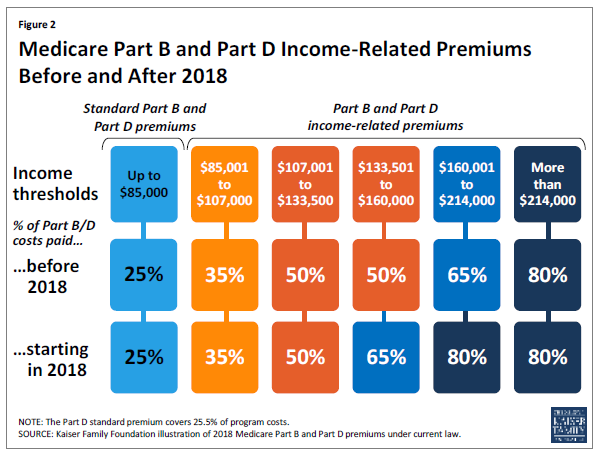 For beneficiaries enrolled in both Part B and Part D, the combined income-related monthly premiums range from $236 (35 percent of program costs) for single beneficiaries with incomes above $85,000 up to $107,000, to $540 (80 percent of program costs) for beneficiaries with incomes above $214,000 (Figure 3). 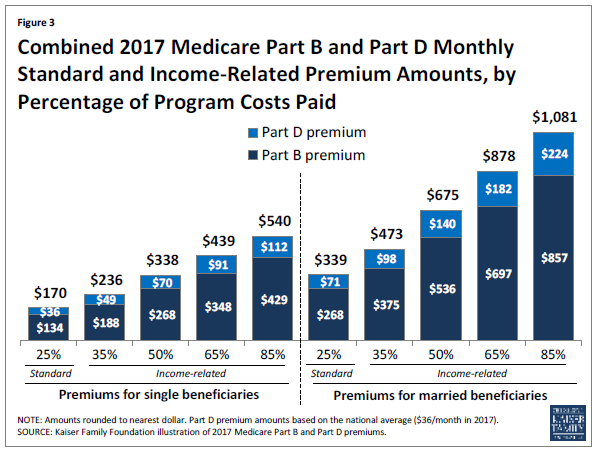 Monthly income-related premiums for married couples who are both enrolled in Part B and Part D are twice these amounts, ranging from $473 for those with incomes up from above $170,000 up to $214,000, to $1,081 for couples with incomes above $428,000. HOW WOULD THE PROPOSED LEGISLATION CHANGE MEDICARE S INCOME-RELATED PREMIUMS? Beneficiaries with incomes above $160,000 but less than $500,000 would pay 80 percent of Part B and Part D program costs, consistent with current law. 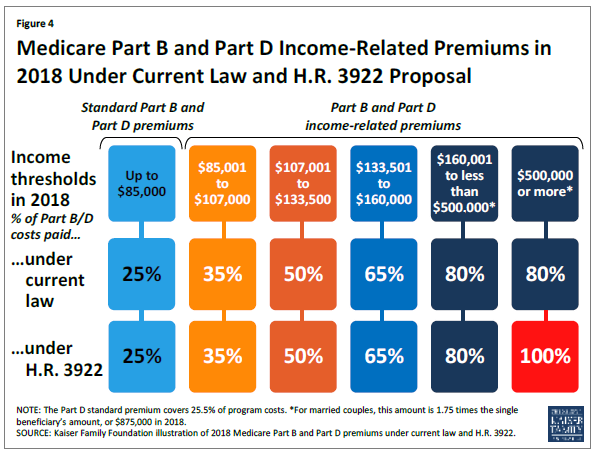 Beneficiaries with incomes of $500,000 or more would pay 100 percent of Part B and Part D program costs. For married couples, this income threshold would be set at 1.75 times the amount that single beneficiaries pay, or $875,000 in 2018. The proposal would also change the inflation adjustment applied to the highest incomerelated premium category beginning in 2027. Increasing premiums for some beneficiaries who are already subject to income-related premiums will affect a relatively small share of the Medicare population. Part of the appeal of requiring higher-income beneficiaries to pay a greater share of Medicare costs is that these higher costs are imposed on only a relatively small share of beneficiaries who arguably have greater financial means to bear the additional expenses, thereby protecting the majority of people on Medicare with relatively modest incomes. At the same time, there is some concern that the income thresholds used to trigger the payment of higher premiums by Medicare beneficiaries ($85,000 for individuals and $170,000 for couples) are lower than the thresholds used to define higher-income people in other policy discussions. There is also concern that imposing higher premiums could discourage higher-income people from enrolling in Part B and Part D, which could further erode Medicare’s financial status in the future. Adopting the House proposal would also mean that for the first time, some beneficiaries would not receive any federal subsidy for their Medicare Part B and Part D coverage and would be required to pay these costs in full. Another concern is that the Medicare savings associated with this proposal are not dedicated to Medicare but instead used to fund other priorities.